By Rich Ross and Ret Talbot Most marine aquarium hobbyists purchase animals for their tanks without much thought to those animals’ origins. This is understandable since most local fish stores and online retailers don’t make that kind of information easily available to customers. Point-of-origin does matter, however, because not all animals are collected sustainably and not all fishers are treated equitably. 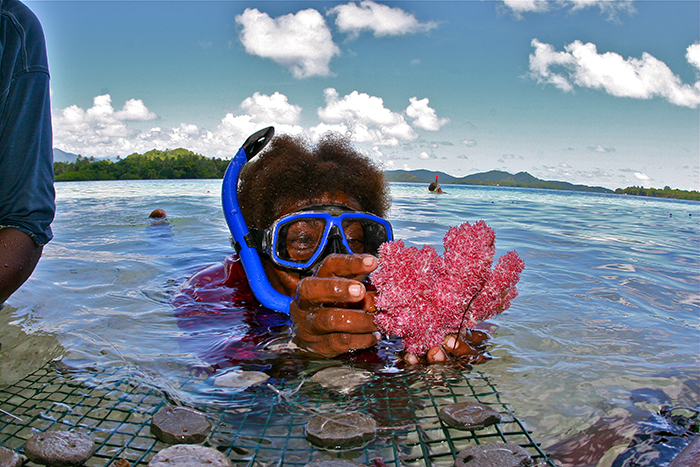 Local divers in Solomon Islands harvest aquarium fishes and corals in what is generally considered a sustainable fishery. In part, sustainability is insured through limited cargo space for exports and long-standing traditions of resource ownership/rights. Photo by Ret Talbot. The marine aquarium hobby and its practices are increasingly scrutinized by anti-aquarium trade activists and environmental advocacy groups, wildlife managers concerned about invasive species introductions and legislators interested in pleasing constituents. A sustainable and equitable trade is a defensible trade; the status quo is not. More important than defense, however, we argue that purchasers of wild animals have a responsibility to know where their animals originate, how they are collected and handled, and what the trade’s effects are on reefs and reef-side communities. It seems that aquarists have a responsibility to treat the animals collected from the wild as the precious commodities they are instead of curios traded for pennies on the dollar. 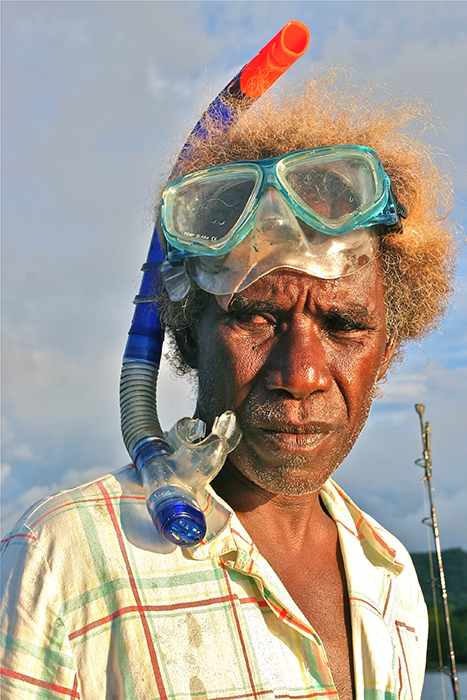 In Marau Sound, Solomon Islands, a group of aquarium fishers and farmers, like the one pictured here, has been sustainably farming coral and collecting fishes for the marine aquarium trade since the 1990s. 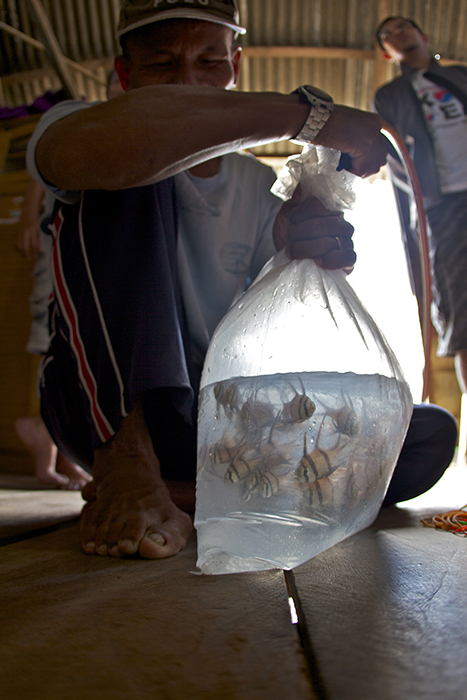 The aquarium trade has been the primary and most consistent source of income for the village. Photo by Ret Talbot. If you know where your animals originate, you often have a better idea of how they were collected and treated through the chain of custody. This should be important to every aquarist because a poorly treated animal is less likely to live or thrive. If the fish you are considering was collected with cyanide, netted in a net used for food fish, deprived of adequate nutrition for weeks, or has been sitting in stagnant water before being shipped, you probably don’t want it. Even if that animal was well cared for in the source country, if it was held in the same bag for 60 hours or mixed with suspect animals at the import facility, it has a lower chance of surviving—much the less thriving—in your tank. Knowing where an animal originated and how it got to the retailer means you can use this information to decide which retailers to support and which to avoid. The more hobbyists who ask for this kind of information (and make these kinds of choices), the more suppliers will have to better their animal handling practices along the entire chain from reef to retail. If you know where your animals originate, you can save money. Many hobbyists get trapped into thinking only in the short term about animal purchases because buying from transparent supply chains where both reefs and fishers are treated well can cost more. While it may seem at the moment of purchase that an animal that is 50% cheaper is the best purchase, it really isn’t if you have to replace that animal three times to get one that survives. By purchasing one quality animal instead of three inferior ones, you avoid supporting the deaths of two animals that only died due to cost cutting measures. Quite simply, you can save money and save animals’ lives by paying more for quality up front. If you know where your animals originate, you can help protect wild reefs and support local communities. While the idea of captive breeding is sometimes held up as the paragon of the responsible aquarium hobby because it means taking fewer animals from the ocean, the captive bred rhetoric sometimes misses the mark. The idea of ‘no take’ doesn’t address other problems that affect reefs, and removing the aquarium trade from the equation can remove a powerful economic incentive for sustainable resource management. Simply put, while it’s true aquarium collection (like all types of fishing) is a stressor, there are many much larger stressors facing reefs. From local stressors like increased agriculture and terrestrial run off, food fishing, coastal development, and pollution to global concerns regarding climate change and ocean acidification, reefs are up against a lot. A sustainable and equitable aquarium trade has the potential to do far more good than harm. 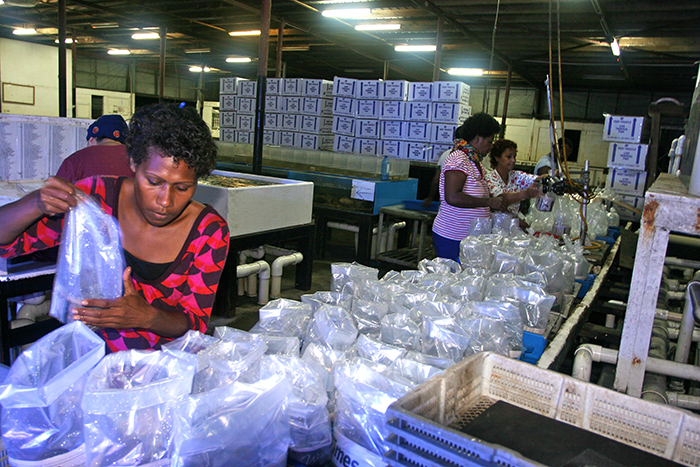 Employees of Walt Smith International pack a shipment of aquarium animals sustainably harvested in Fiji. Traditional resource ownership/rights in Fiji have largely kept individual villages connected to their adjacent reefs, insuring sustainability. Photo by Ret Talbot. When fishers are invested in collecting from their local reefs for the aquarium trade, they have economic incentive to protect those reefs long term. When aquarium fisheries close, the alternatives often incentivize destructive fishing activities like the harvest of large reef herbivores or dynamite fishing for food. When aquarium fisheries are shut down, the alternatives can be illegal black markets such as the trade in beche-de-mar (sea cucumbers) or other more damaging extractive industries like unsustainable commercial fisheries, coastal logging and the like. If we support collectors who treat their local reefs as renewable forests and harvest responsibly, then we directly support people who have a vested interest in keeping wild reefs healthy. If you agree supporting a sustainable and ethical aquarium trade is a good idea for you, for the hobby, and for reefs and reef-side communities, then you probably want to know what you can do. How do you support the good and avoid the bad when it’s still so difficult to know where the animals you see at the local fish store originate? We’re not going to sugarcoat this: It can be difficult. Often the information you need is not readily available, but purchasing animals sourced through reputable importers who make point-of-origin information available to the retailers they supply is a good starting point. We know, for example, a fish sourced from smaller developing island nations like Fiji and Solomon Islands is far more likely to have been sustainably and ethically harvested than an animal sourced from Indonesia or the Philippines. This is, in part, because supply chains in the smaller countries are often shorter and more transparent. While there are sustainable aquarium fisheries in Indonesia and the Philippines, the lack of supply chain transparency, as well as the lack of enforcement of existing laws in those countries, makes purchasing an animal from these countries a much riskier proposition at this time. This can change, but we all have to collectively care. Many of the fisheries in Indonesia operate without sufficient transparency and utilize unsustainable, illegal and unethical practices. The Banggai cardinalfish fishery is the highest profile fishery in Indonesia with well-documented problems. Photo by Ret Talbot. We can think of this issue in the same way people thought of fair trade coffee at the beginning of that movement. We can use our purchasing power at the point of sale to help direct the hobby we want to see ten years from now. If we don’t make the effort, either nothing will change or the changes made will be Draconian and handed down by a regulatory or legislative body that will not care what happens to the hobby. Healthy reefs benefit the hobby directly and the world indirectly, and if we, people who say we love the reefs and their animals, don’t put forth the effort to ensure that the animals we have in our homes are treated well from collection to retail, how can we possibly expect the rest of the world to take us seriously?